Mark Greening, Tim Bagshaw and Adam Richardson return for the third Ramesses album, and once again their brand of post-Electric Wizard psychedelic misery is little short of fantastic. The band photo on the front cover may suggest a little more of a rock n’roll vibe to proceedings, and indeed there’s a notable line of melody buried deep beneath the rumbling, primordial gloom, although it’s still a long way beyond what will be comfortable listening. 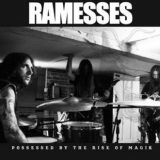 Where Ramesses have grown as a band is in their atmospheric abilities, the slow, subtle Towers Of Silence building up in classic doom fashion despite sounding as if it was recorded in a garage. An air raid siren pierces the air at the opening of Sol Nocivo, sludgy doom soon joining it in a nightmarish ramble through devastated landscapes as Richardson howls at the dead sun. The chilling Plague Beak, a slow militaristic drum beat underpinning mournful meandering, and oddly groovy Duel have the sort of uneasy grimness that oozes from the best funeral doom, something that you can perhaps attribute to two of the members of the band having been in Electric Wizard. Like Electric Wizard, this is psychedelic and yet very grounded in reality. I’d say it’s lighter than Ramesses have been in the past, in some ways, although often in a misleading way – the almost laid-back title track is deceptively gentle at first, verging on post-punk at times, before building into something resembling horrific black metal. Yes, it’s a trick the band used successfully on their previous album, Take The Curse, but it’s so perfectly fitting in atmospheric terms that its repetition here can’t help but be welcomed. Ramesses are progressing overall, of course, yet they still seem doomed to the underground forever, forced to crawl alongside the likes of Unearthly Trance in a strange hinterland between the funeral doom and stoner worlds, both fetid darkness and drug-fuelled paranoia playing a strong part in what makes them worth hearing. And worth hearing Ramesses are.